The 55 metre fast crew supply vessel, jointly listed for sale by Merle Wood & Associates and Camberley International, has had a €2,000,000 price reduction. Built in steel by Dutch yard De Hoop, she was delivered in 2016 and the intention of the sellers is that she could easily be converted to a shadow vessel or a go-anywhere expedition yacht. In fact, Dutch naval architect Cor D Rover has already drawn up designs to realise either eventuality on this yacht for sale. She currently has a massive deck area of 230 square metres with a total load capacity of 200 tons, easily enough to accommodate a helicopter, submarine, or any number of water toys. She also comes with a Class 1 Navis dynamic positioning system with a combined console for forward and aft navigation and control. This means she can hover at a set location without dropping anchor while guests enjoy diving down to coral reefs, making her thoroughly environmentally friendly. All electric and electronic systems are state-of-the-art and include two 1.2 metre radar scanners. For safety, she has no fewer than six life rafts, each capable of carrying 20 persons. During sea trials she proved to be stable, seaworthy and very economical on fuel and her green credentials are borne out by a hybrid diesel electric propulsion system employing two 3,516hp MTU engines to reach a maximum speed of 22 knots. 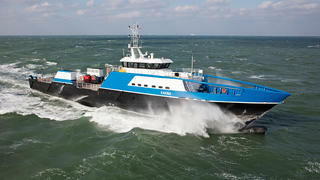 Available to view in the Netherlands, the Fast Crew Supply vessel is now asking €7,900,000.